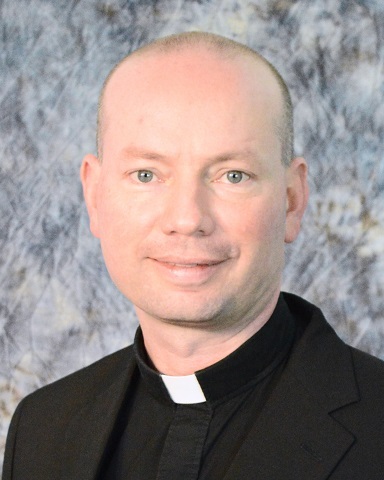 Father Brian D. Konopa became pastor at MMOC in July 2014. Visit our Pastor's Page. Deacon Richard Sage has served St. Pius X Parish, and later MMOC, for about three decades. His biography appears on Dn. Richard's page. 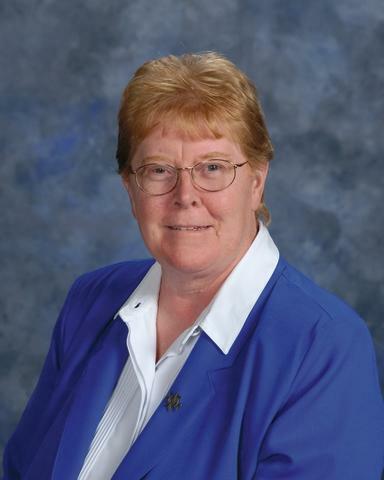 Sister Kathy Stuttgen, FSPA, serves as a pastoral minister to and advocate for our elders, widows and widowers, and all in our parish family who are sick. Her biography appears on Sr. Kathy's page. Fr. Douglas C. Robertson was pastor of Mary, Mother of the Church Parish from 2008 to 2014. He served during the challenging time when our parish faced the closure of St. Thomas More School. Under his stewardship the parish dramatically reduced its debts and adopted new technologies. Msgr. David Kunz was our pastor from 2002 to June 2008. He now serves as Vicar for Clergy in our Diocese, carrying out the 2008 Pastoral Plan that he had a lead role in formulating. Fr. Joseph J. Rafacz was pastor of St. Thomas More parish (1997–2002) and St. Pius X parish (1991–2002). He served during the challenging time of their reunification in 2000 to form Mary, Mother of the Church parish. Fr. Joe passed away 27 August 2013. Eternal rest grant unto Joseph, O Lord, and let perpetual light shine upon him. May he rest in peace. Fr. Richard Fliss was pastor of St. Thomas More parish from 1989 to 1997. He retired in June 2008 and died in 2016. Eternal rest grant unto Richard, O Lord, and let perpetual light shine upon him. May he rest in peace. Fr. Bill Grevatch (left) and Fr. Peter Knippel (right) were named co-pastors of St. Pius X parish in 1978. Fr. Grevatch became pastor in 1979. Fr. James Falconer was pastor of St. Thomas More parish from 1976 until his death on 14 October 1988. Eternal rest grant unto James, O Lord, and let perpetual light shine upon him. May he rest in peace. Fr. Jerome Hoeser was pastor of St. Thomas More parish from 1974 to 1976. Fr. 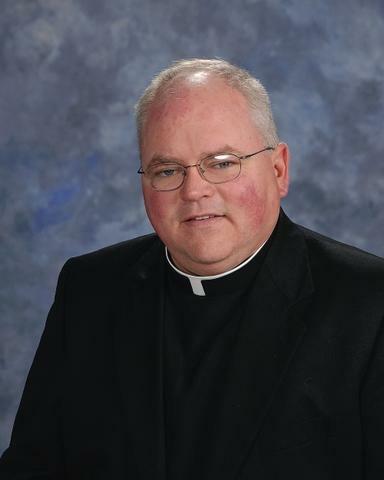 Hoeser is now pastor at St. Henry Parish in Eau Galle, Wisconsin. Fr. Peter Butz was pastor of St. Pius X parish from 1968 to 1978. Eternal rest grant unto Peter, O Lord, and let perpetual light shine upon him. May he rest in peace. Fr. 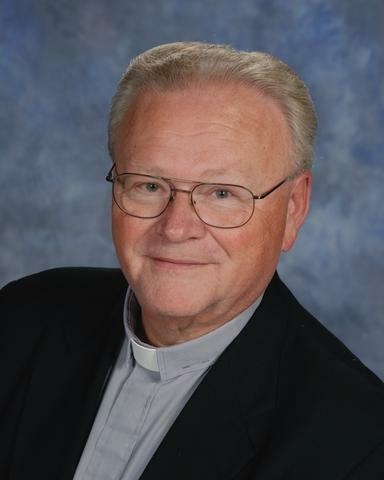 Edwin Thome was pastor of St. Thomas More parish from 1968 to 1974 and served as senior pastor at MMOC from 2001 until he retired in May 2008. We celebrated his Mass of Christian Burial at MMOC on May 15, 2018. Eternal rest grant unto Edwin, O Lord, and let perpetual light shine upon him. May he rest in peace. Fr. Francis V. McCaffrey was pastor of St. Pius X parish from its founding in June 1960 until 1968. Eternal rest grant unto Francis, O Lord, and let perpetual light shine upon him. May he rest in peace. Fr. Thomas E. Mullen was pastor of St. Thomas More parish from 1950–1968. Eternal rest grant unto Thomas, O Lord, and let perpetual light shine upon him. May he rest in peace. Fr. Joseph M. Wagner was named the founding pastor in 1946 when St. Thomas More parish branched off from Holy Trinity Catholic Church. He presided during the construction of St. Thomas More School and remained pastor until 1950. Eternal rest grant unto Joseph, O Lord, and let perpetual light shine upon him. May he rest in peace. Sr. Barbara Bashaw was the daughter of Leona and Harold Bashaw, who were active members of St. Thomas More parish from its founding. Barbara was born in 1940, the 4th of 10 children. She attended St. Thomas More School from 3rd to 8th grade. In 1958 she entered the St. Bede Monastery where she was trained as a teacher. She returned to St. Thomas More School in the 1970's as a member of the faculty. We pray: Eternal rest grant unto Barbara, Harold, and Leona, O Lord, and let perpetual light shine upon them. May they rest in peace. The Benedictine Sisters of St. Bede have a bond with our parish that goes back to when both communities were in their founding days. Sisters came from St. Bede Monastery to form the original faculty of St. Thomas More School when it opened in September 1948. To honor their service, Window #10 in our church is dedicated to symbols of the Order of St. Benedict. In 2010, the sisters joined a monastery in St. Joseph, Minnesota, and the St. Bede Monastery in Eau Claire became a retreat and conference center. 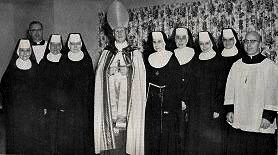 The first Benedictines (L to R): Sisters James, Agnesine, Therese, Dale, Mary Jane, Vernona, Niceta, and Ralph. Sister Mary was absent when the photo was taken. Temporary convent was at 1803 Barlow St.